The paintings are very reasonably priced – some are at under a £100 for an original work. Most are painted on cold pressed 300gsm papers and sized around 400mm x 280mm. They are paintings not prints. I also paint from commission. I’ve been lucky enough to have work shown at the Bankside Gallery, The Mall Galleries and the East Finchley Open. I contribute annually to the HWG exhibition at Lauderdale House in Highgate. A price list is available. Do get in touch! 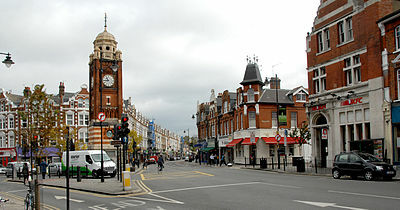 I’ve lived in Crouch End, North London, for a while now. Once ‘Highgate borders’ it’s a place in its own right. There’s no tube, it has a village feel as it has pubs, bars, small shops, a town hall, library, a parish church and the clocktower gives it a focus. There’s a thriving creative arts community. It’s also close to Highgate and I’m an active member of the Highgate Watercolour Group.